$42.00 As Low As $1.68 ea. 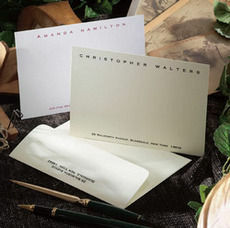 Corinthian correspondence cards take a classic approach to note writing. Your name or initials in a block typestyle is the focus of these heavyweight 6.25” x 4.5” flat cards. Available in your choice of stock and raised ink color. Matching blank envelopes included. 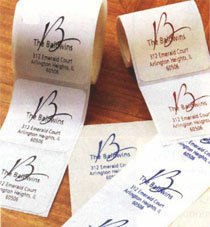 Printed return address available. Typestyle, positioning and format only as shown. TIP: For 3-letter initial option, letters are the same size. Enter letters in the order they should appear. Beth Carole Smith would be BCS. Stephen James Gorman would be SJG. Usually same size initials represents one person, not couple.